Pakistan Weather Portal (PWP) on May 7 told its followers that a low pressure might form in the Arabian sea during the second last week of May as supported by an American model however the low did not form as it was expected but the same area of thundershower remained confined near the coasts of Yemen and Somalia as of May 30. Omani Track – Is it out? Other foreign models are not showing any kind of such development which shows that the threat of a cyclone is minimum in the Arabian sea. They show that the disturbed area would move towards central Arabian sea to dissipate as vertical wind shear remains high. If a cyclonic storm (Indian ranking) does form in the sea then it would be named as Murjan by the IMD. Murjan is a name given by Oman which is pronounced as “Mur-Jaan”. It is an Arabian word meaning marine animals. 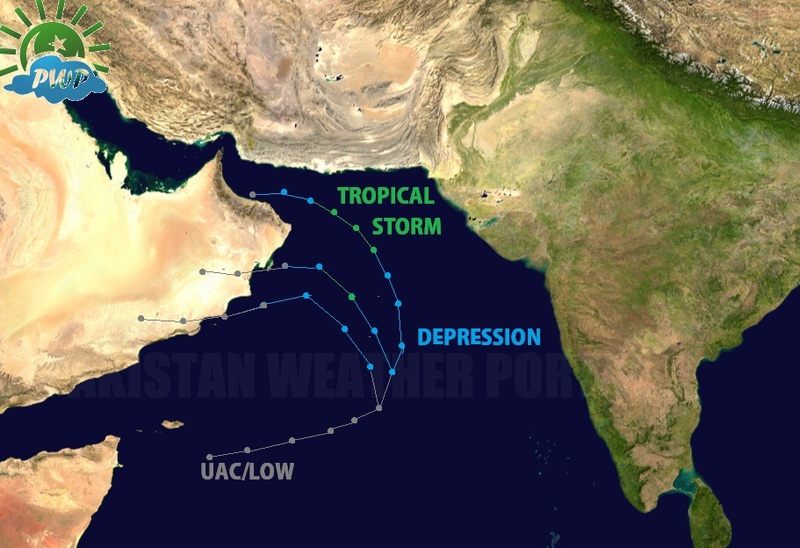 Latest runs on May 28 by the same model indicate that the disturbed area would move towards the central Arabian sea and it would slowly organize itself into a tropical depression (25%) during the first week of June and may attain a weak tropical storm status (5%) as it moves towards Oman and decays after crossing the coast during the early two weeks of June. The other track shown in the PWP-Track Map indicates that the upper air cyclonic circulation might intensify into a well-marked low pressure/weak depression status before moving towards Oman and adjoining Yemen. Other tracks by the same model does indicate that even if the area of thundershowers does not intensify it would move towards Oman or Oman and adjoining Yemen and in this Oman may get some summer showers during early June. The other tracks would also revolve around them as well. There are chances that after 72 hours a low pressure area may form in the south-west Arabian sea that would eventually move in a north-north-eastward direction and it may intensify into a tropical depression (25%). As of May 29 at 10:11 pm PKT, the same model indicates a slightly different track that the depression will intensify into a tropical storm (5%) and move in a ENE direction before rapidly weakening and dissipating near the Indian coast of Gujarat. There are chances that after 48 to 72 hours a low pressure might form in the south-west of Arabian sea. The area of thunderstorm is present over the sector where the temperatures are about 27°C to 28°C that are likely to cause a low pressure to develop in coming days. Due to penetration of westerlies the track of the system has changed from NW to NE towards western Indian coast. The system may intensify into a tropical depression (25%) as it heads in a NNE direction over some what cooler temperatures than where it is situated right now. There are still 5% chance that it may intensify into a tropical storm. The storm is expected to weaken considerably before moving over any land, as shown in the above Tracks of PWP-Map. Latest satellite pictures indicate that the disturbed area near northern Somalia has persisted as of May 30. There are chances that after 36 to 48 hours a low pressure might form in the south-west Arabian sea that would move in a NNE direction and might deepen into a tropical depression (25%) but as it moves towards the Indian coast of Gujarat it would weaken rapidly and move over the coast as a remnant. PWP-TRACK 5 has slightly changed. The chances of intensification into a tropical storm has dropped to 3%. Due to this track there are chances that Pre-monsoon showers would start over the Gujarat- adjoining Maharashtra coast on June 6/7 with some moderate falls as the low will attract the moisture from Kerala causing a slight decrease in activity over there. A low pressure might form in the south-west Arabian sea after the next 24 to 36 hours that would deepen into a tropical depression at 1004 mbar before weakening and heading towards the Gujarat coast and adjoining eastern coast. The track is shown in the above PWP-TRACK 7. Pre-monsoon showers would start over the Gujarat- adjoining Maharashtra coast during the end of coming week with some moderate falls as the low will attract the moisture from Kerala causing a slight decrease in activity over there. Track 8 – Weaker ! 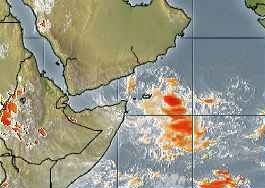 A low pressure area might form in the south-west Arabian sea near northern Somalia after 12 to 24 hours and it is likely to move in a more eastwards direction as westerlies is expected to penetrate into the region, forcing the system to move further eastwards. The temperature where the upper air cyclonic circulation is favourable due to the change in track due to the westerlies the low may move in a the area of unsuitable vertical wind shear. It is expected to decay before moving over the land, the chances of intensification into a depression has dropped to 10%. Due to further change in track, cloudy periods might occur at coastal Gujarat while increase in rainfall is expected in Maharashtra-Karnataka coast from this remnant. The upper air cyclonic circulations in the south-west Arabian may intensify into a weak low pressure after that it would start to weaken, it may move towards the western Indian coast where it would persist for few days as an UAC. Track 8 valid. The Bay of Bengal was actually two times forecasted to give birth to a depression however it failed to give birth both the times. A poll conducted by PWP on May 7 showed that 71% people believed that this year Arabian sea would give rise to a tropical depression earlier than the Bay of Bengal. What about now! More information would be provided only if necessary! ← Total collapse of Monsoon expected in July? any rain in karachi this storm . babar bhai just wondering. Any Chances of pre-monsoon for khi? As of now there are no chances of any monsoon activity in karachi. And there won’t be any chance afterwards. Babar bhai Sindh m is tropical depression ki waja se rains ho sakti hein??? babar bai karachi me rain huskti ha k nai is cyclone ki waja se??? @ K.M, No rain expected over Karachi and everybody say this same thing. Karachi rain is nothing in front of Mumbai/Goa and Arabian sea is totally useless for Karachi regarding weather.